Another standard social HR tool is an employee self-service portal or, to be exact, an intranet that comes with self service features. As the name implies, an ESS portal allows your workers greater autonomy and lightens your HR department workload by allowing employees to get necessary services themselves. Letting your employees create customizable intranet profiles not only frees up your HR department and system administrators, but allows for greater self-expression. 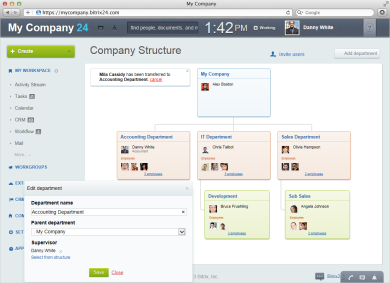 In addition to that, your employees decide what information they want to be available to others in the company. 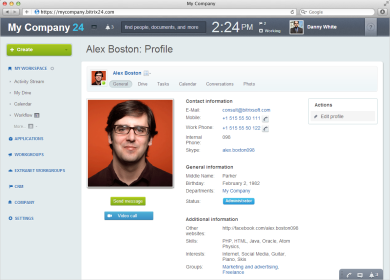 So the contemporary social HR features like personal photo gallery, blog, calendar, instant messenger and other tools are at the command of your users. 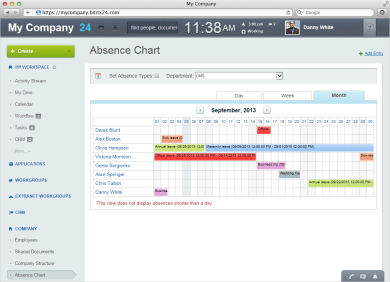 A self-service portal lets you put in annual leave or business process requests directly from your intranet. The requests are approved or denied by supervisor(s), after which the Absence Calendar is updated and HR department is notified, if necessary. The whole process is automated. This is a key function of any ESS portal. 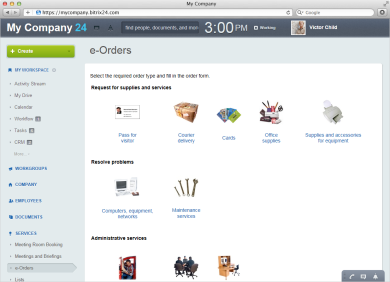 Typically, e-orders and service requests are put in for office supplies, IT assistance, maintenance orders and so on. Because business needs are different, service requests should be easily customizable to fit your company. Many companies hold regular meetings, so the ability to book a meeting room for a particular time slot and to invite colleagues comes with most self-service portals. 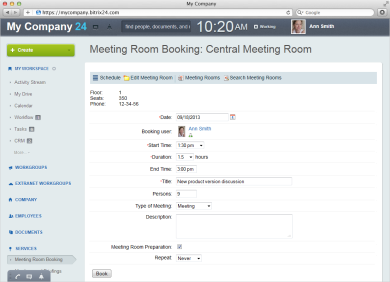 In Bitrix24, you also have an option to host virtual meetings via free videoconferencing. Finally, every ESS portal must come with employee resources. These may be employee manuals, employee directory, company document repository, HR forms, media gallery, company calendar and so on.